AWST: Womens T-Shirt, Horse Caps, Equine Infinity Scarf, Knee Socks! Youth Tee "I Love Horses" Sport Grey #A487: Sport Grey youth tee with Lila© "I Love Horses" 100% preshrunk cotton, 3/4" seamless top stitched collar. Available in youth sizes. Great gift idea! ORDER NOW! • Youth Tee "I Love Horses" Sport Grey SMALL: ORDER NOW! • Youth Tee "I Love Horses" Sport Grey MEDIUM: ORDER NOW! 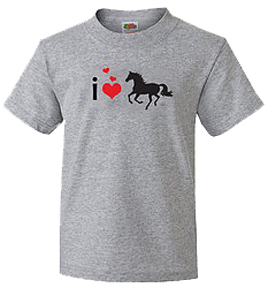 • Youth Tee "I Love Horses" Sport Grey LARGE: ORDER NOW! 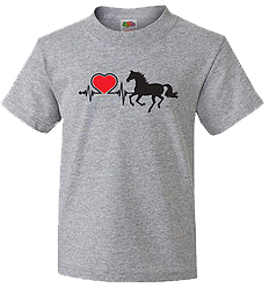 Youth Tee "Heart Beat Horse" Sport Grey #A485: Sport Grey youth tee with Lila© "Heart Beat Horse" 100% preshrunk cotton, 3/4" seamless top stitched collar. Available in youth sizes. Great gift idea! ORDER NOW! • Youth Tee "Heart Beat Horse" Sport Grey SMALL: ORDER NOW! • Youth Tee "Heart Beat Horse" Sport Grey MEDIUM: ORDER NOW! • Youth Tee "Heart Beat Horse" Sport Grey LARGE: ORDER NOW! 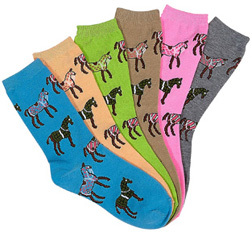 • Horses in Blankets CREW SOCKS #A814: Horses in blankets, Ladies' Crew Socks. 97% polyester, 2% spandex, 1% rubber. Sold in 6 pack, 1 of each color. Ladies size 9-11. Great gift idea! ORDER NOW! 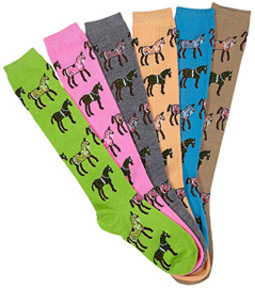 • Horses in Blankets KNEE SOCKS #A816: Horses in blankets, Ladies' Crew Socks. 97% polyester, 2% spandex, 1% rubber. Sold in 6 pack, 1 of each color. Ladies size 9-11. Great gift idea! ORDER NOW! 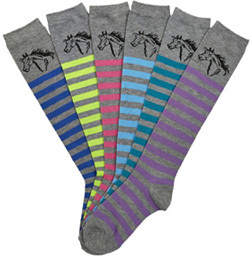 • Lila Horse Head STRIPE CREW SOCKS #A812: Colorful "Lila" Horse Head, Stripe, Ladies' Crew Socks. 97% polyester, 2% spandex, 1% rubber. Sold in 6 pack, 1 of each color. Ladies size 9-11. Great gift idea! ORDER NOW! 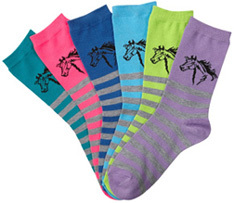 • Lila Horse Head STRIPE KNEE SOCKS #A807: "Lila" horse head, stripe knee socks. 97% polyester, 2% spandex, 1% rubber. Sold in 6 pack, 1 of each color. Ladies size 9-11. Great gift idea! ORDER NOW! 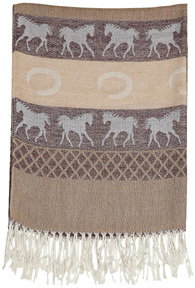 Lila Linear Horse Pashmina Scarf BROWN #GG1020BR: "Lila" Pashmina with ivory linear horses. 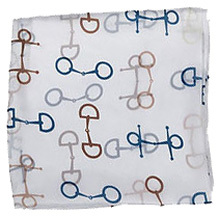 100% Polyester, 28 X 72 inches. ORDER NOW! 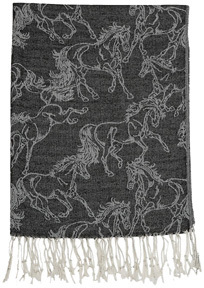 • Lila Linear Horse Pashmina Scarf BLACK #GG1020BK: "Lila" Black Pashmina with Ivory linear horses. 55% Pashmina 45% SIlk, 28" X 72". ORDER NOW! 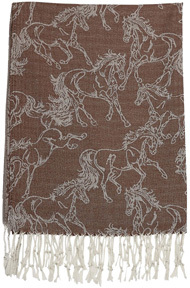 • Equestrian Fashion Scarf BROWN/White Horses #GG1035BR: Brown equestrian fashion scarves are 28" x 72". 55% Pashmina 45% Silk. ORDER NOW! 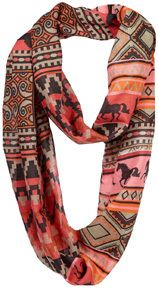 • Equestrian Fashion Scarf PINK/White Horses #GG1035PK: Pink equestrian fashion scarves are 28" x 72". 55% Pashmina 45% Silk. ORDER NOW! 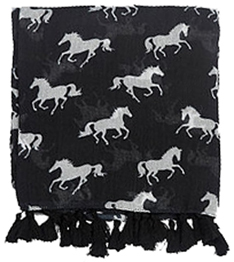 • Tassel Horse Scarf BLACK #GG1045BK: Black & White "Lila" tassel scarf. 100% voile polyester. 38" x 70". ORDER NOW! 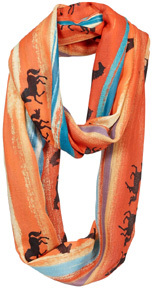 • Tassel Horse Scarf TEAL #GG1045TE: Teal & Black "Lila" Tassel Scarf. 100% voile polyester. 38" x 70". ORDER NOW! • "Lila" Infinity Scarf SOUTHWESTERN Orange/Black #GG1042: "Lila" Southwestern Infinity Scarf, 100% textured Polyester. 20 x 72 inches. ORDER NOW! • "Lila" Infinity Scarf SOUTHWESTERN Orange/Blue #GG1041: "Lila" Southwestern Infinity Scarf, 100% textured Polyester. 20 x 72 inches. ORDER NOW! 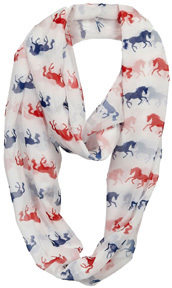 • "Lila" Infinity Scarf Silhouette Horses BLUE/RED #GG1038RWB: Blue and Red Horses on White background Infinity Scarf. 100% Chiffon Polyester. Measures 24 x 72 inches. ORDER NOW! 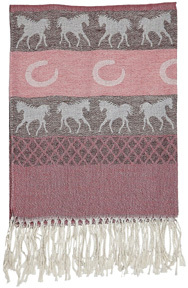 • "Lila" Infinity Scarf Galloping Horses PINK/BLUE #GG1050BP: "Lila" Pink & Blue Galloping Horses on White back ground. 100% Chiffon Polyester. Measures 20 x 70 inches. ORDER NOW! 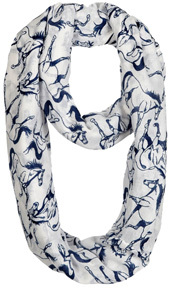 • "Lila" Infinity Scarf NAVY Linear Horses #GG1039NV: "Lila" infinity scarf. Ivory with Navy linear horse design. ORDER NOW! 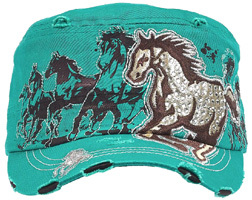 • Vintage Rhinestone Horse Cadet Cap TURQUOISE #AC107TQ: Adjustable Teal Cap has "worn" look and is featured with White and Silver accents. Printed Brown horses accentuated in White trim and a two-tone Brown, embroidered horse emphasized by Silver and White trim and decked with Rhinestones. Embroidered Silver horse on the edge. Noteworthy headwear to perfect your western expression! ORDER NOW! 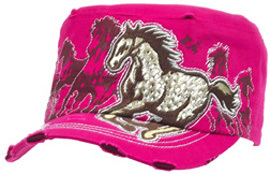 • Vintage Rhinestone Horse Cadet Cap PINK #AC107PK: Perfect your look with a Vintage Rhinestone Horse Cadet Cap. 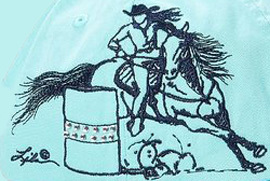 The horse design is exquisitely embroidered and highlighted with metallic thread. It is garment washed for a soft feel. The distressed look and the Rhinestones for expression will keep you current with today's fashions! 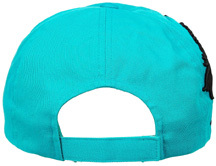 It has an adjustable strap and metal buckle on the back of the hat. ORDER NOW! 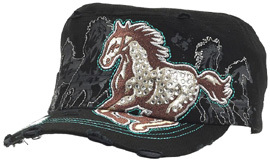 • Vintage Rhinestone Horse Cadet Cap BLACK #AC107BK: Adjustable Black Cap has "worn" expression and is decorated with Teal and Silver accents. Printed gray horses presented in White trim along with a two-tone Brown, embroidered horse adorned by Silver, White and Teal trim and decked with Rhinestones. Embroidered Silver horse on the edge. Ideal headwear to finish your western look! ORDER NOW! 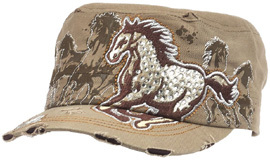 • Vintage Rhinestone Horse Cadet Cap KHAKI #AC107KH: Adjustable Black Cap has "worn" expression and is decorated with Brown and Silver accents. Printed gray horses presented in White trim along with a two-tone Brown, embroidered horse adorned by Silver, White and Brown trim and decked with Rhinestones. Embroidered Silver horse on the edge. Ideal headwear to finish your western look! ORDER NOW! 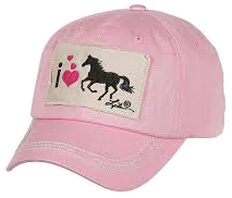 • "I Love Horses" Cap PINK #AC119PK: Pink Cap with Lila "I Love Horses" patch. Distressed and low profile. 100% cotton with adjustable Velcro closure. ORDER TODAY! 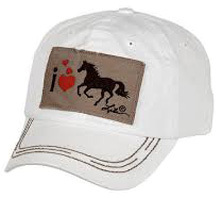 • "I Love Horses" Cap WHITE #AC119WH: White Cap with Lila "I Love Horses" patch. Distressed and low profile. 100% cotton with adjustable Velcro closure. ORDER TODAY! 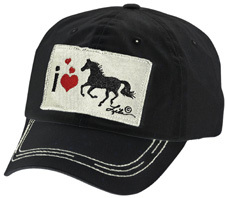 • "I Love Horses" Cap BLACK #AC119BK: Black Cap with Lila "I Love Horses" patch. Distressed and low profile. 100% cotton with adjustable Velcro closure. ORDER TODAY! 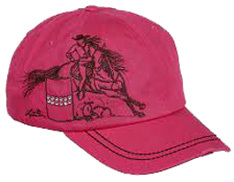 • Barrel Racer Cap PINK #AC118PK: Pink Cap with Lila Barrel Racer design embroidered on the side. Distressed and low profile. 100% cotton with adjustable Velcro closure. ORDER TODAY! 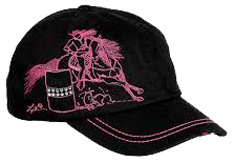 • Barrel Racer Cap BLACK #AC118BK: Black Cap with Lila Barrel Racer design embroidered on the side. Distressed and low profile. 100% cotton with adjustable Velcro closure. ORDER TODAY! 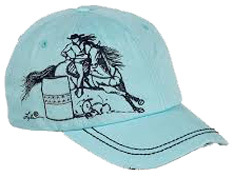 • Barrel Racer Cap MINT #AC118MT: Mint Cap with Lila Barrel Racer design embroidered on the side. Distressed and low profile. 100% cotton with adjustable Velcro closure. ORDER TODAY! • Rhinestone Snaffle Bit Visor: Helps prevent sun out from your eyes, whether you are at the horseshow, at the barn or anywhere outdoors. 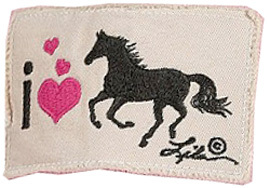 This is a great visor stylishly adorned with sparkling Rhinestone Snaffle Bit logo on the front. Great for summer or all year round. 100% Cotton and one size fits all with the easy to adjust Velcro back. Great gift idea! • Rhinestone Snaffle Bit Visor Navy #AC78: ORDER NOW! 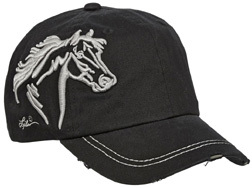 • Embroidered Cap BLACK #AC41: Black Cap that is embroidered with Lila© horse design. ORDER NOW! 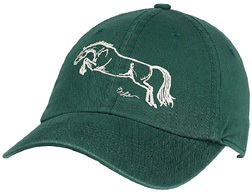 Embroidered Horse Cap: Embroidered, garment washed, unstructured, 6-panel, low profile caps. Adjustable cloth back strap with metal buckle and snap in back ensures one size fits most. Embroidery is contrasting color. 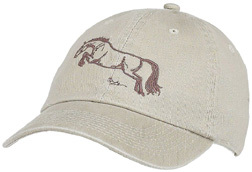 An equestrian motif cap designed to get you noticed. Great gift idea! 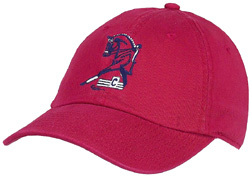 • Embroidered Cap Half Horse Trot RED #A112HHT: ORDER NOW! 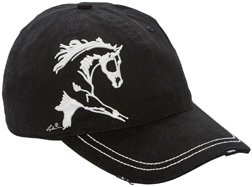 • Embroidered Cap Half Horse Trot BLACK #A112HHT: ORDER NOW! 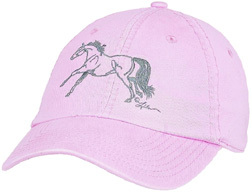 • Embroidered Cap Galloping 2 PINK #A112G2: ORDER NOW! 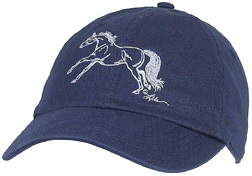 • Embroidered Cap Galloping 2 NAVY #A112G2: ORDER NOW! • Embroidered Cap Jumper KHAKI #A112J: ORDER NOW! • Embroidered Cap Jumper FOREST #A112J: ORDER NOW! Distressed and low profile. 100% Cotton with adjustable Velcro closure. Great gift idea! 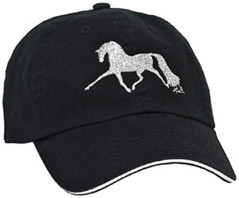 • 3-D Horse Cap Extended Trot BLACK #AC115BK: Black Cap with Lila© 3-D Extended Trot Dressage Horse design on the side. ORDER NOW! 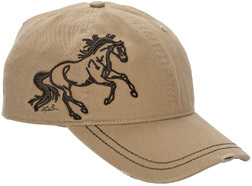 • 3-D Horse Cap Galloping Horse TAN #AC114TN: Tan Cap with Lila© 3-D Galloping Horse design on the side. ORDER NOW! 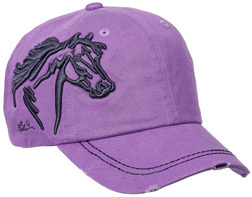 • 3-D Horse Cap Horse Head LAVENDER #AC113LV: Lavender Cap with Lila© 3-D Horse Head design on the side. ORDER NOW! 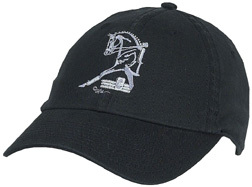 • 3-D Horse Cap Horse Head BLACK #AC113BK: Black Cap with Lila© 3-D Horse Head design on the side. ORDER NOW! 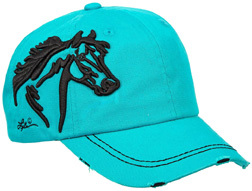 • 3-D Horse Cap Horse Head TURQUOISE #AC113TQ: Turquioise Cap with Lila© 3-D Horse Head design on the side. ORDER NOW! 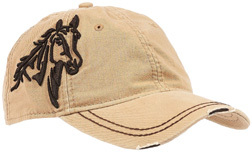 • 3-D Horse Cap Horse Head TAN #AC99: Tan Cap with 3-D Horse Head design on the side and a stressed worn look. ORDER NOW!